When Apple discontinued their 17” MacBook Pro line, many Apple fans held onto a glimmer of hope it might one day return. Since then, (nearly 7 years as of this article) online petitions requested Apple to bring back their 17” laptop screen, but these petitions had little support. 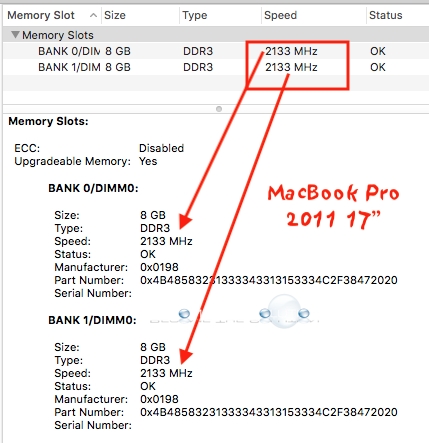 The last official 17” MacBook Pro model released was the MacBook Pro Core i7 2.5 17” Late 2011 found here. Today, it is highly unlikely Apple will ever release another 17” laptop screen. The larger laptop screen size has a limited marketplace for Apple and the demand for portability (mobile devices, phones) and efficient (long lasting battery life) computing is the forefront of Apple’s technological spectrum. This article is dedicated to the die-hard Apple fans of the fastest 17” MacBook Pro 2011 model money can buy. It is important to understand what the last model MacBook Pro 17” featured. Here’s a break down of the technical details. Note: The MacBook Pro 17” 2011 models are officially discontinued and no longer supported or cared for by Apple and authorized Apple retailers. This means, the laptops are as-is on the market today. 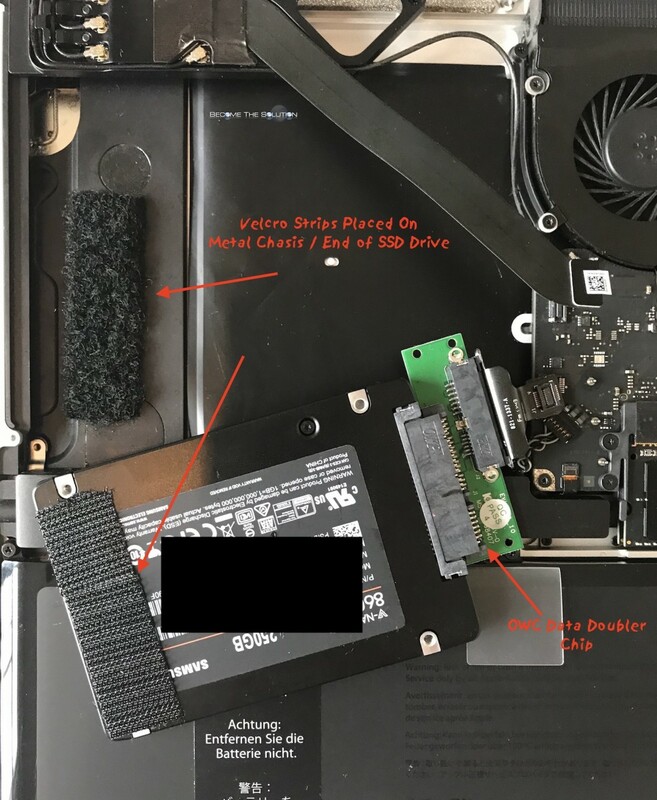 This model MacBook Pro suffered video issues and many units were recalled under the repair extension program offered by Apple. Read more here. Therefore, if you intend to purchase a 17” 2011 MacBook Pro, you are taking a gamble if you plan to use it as a long term computer. It is extremely rare to find new MacBook Pro 17” 2011 models (and if you did, they may suffer the video issue we mentioned earlier). However, with great care and routine maintenance, the MacBook Pro 17” 2011 models can last a lifetime. 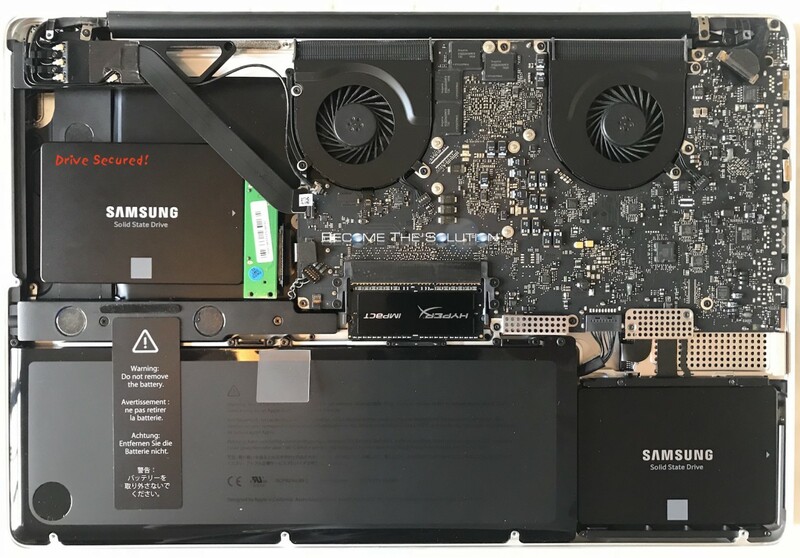 This eBay listing - here will repair and replacet a MacBook Pro 2011 faulty GPU under $200 and include shipping! Might be able to find one here on Amazon. Or eBay. 8 Mb cache w/ Turbo Boost 3.6GHz. Launched by Intel in Q4’11, it is considered a legacy Intel processor. 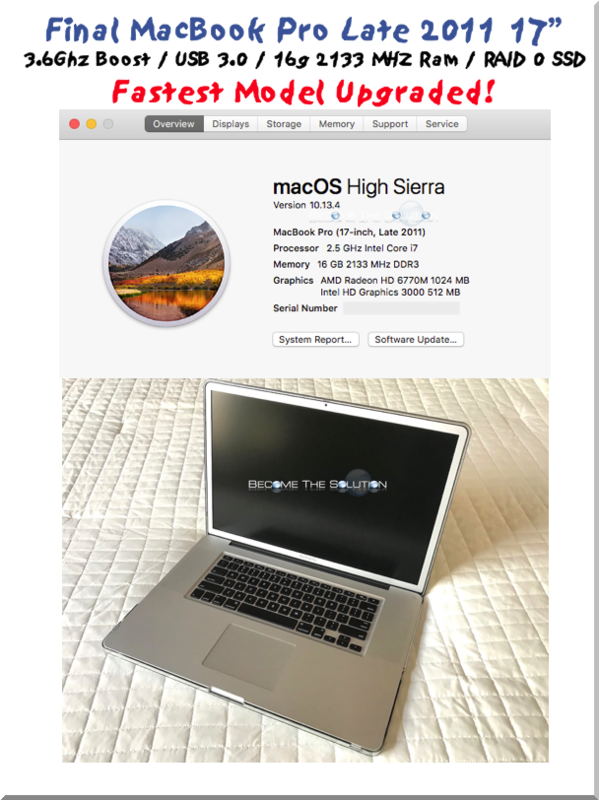 While the i7-2860QM Processor officially supports 32g RAM and 16g DDR3 ram modules now exist, these modules were tested in this MacBook Pro model and it will not post a boot (beeps indicating no ram installed). At this time, there are no success stories of a MacBook Pro 17” 2011 booting with 32g of ram. There are also different manufactures of 32g (2x 16g) laptop ram on eBay that have not been tested. Wireless AC/Bluetooth 4.0 replacement card? In 2015, a company called QuickerTek created a replacement motherboard card with Wireless 802.11ac and Bluetooth 4.0. The product required a driver for Bluetooth 4.0, however did not require a driver for wireless, according to reports. It is unknown if the product is compatible with Mac OS High Sierra today. After reaching out to QuickerTek via email, they confirmed the card was discontinued a few years ago due to it being “too hard for end users to install”. You, can however, upgrade the default MacBook Pro 2011 Bluetooth from 2.1 to 4 using this motherboard card replacement on Amazon. We wanted the fastest possible read/write speeds using the fastest SSD drive availiable. A RAID 0 hard drive configuration allows you to split read/write processes across two or more hard drives, effectively doubling your read/write speeds. As of this article, the Samsung EVO 860 SSD drive has read/write speed of ~500MB/s making it one of the fastest SSD for SATA III (6BG/s) available. The MacBook Pro 17” Late 2011 8,3 model optical drive bay SATA connection is a “luck of the draw” SATA II (3Gb/s) or SATA III (6Gb/s). It would seem most models are equipped with a SATA III connection based on online. Online reports have suggested the optical drive SATA connection is unreliable or incapable of handling a solid state drive at 6GB/s speeds. This used to be true in earlier versions of Mac OS X. 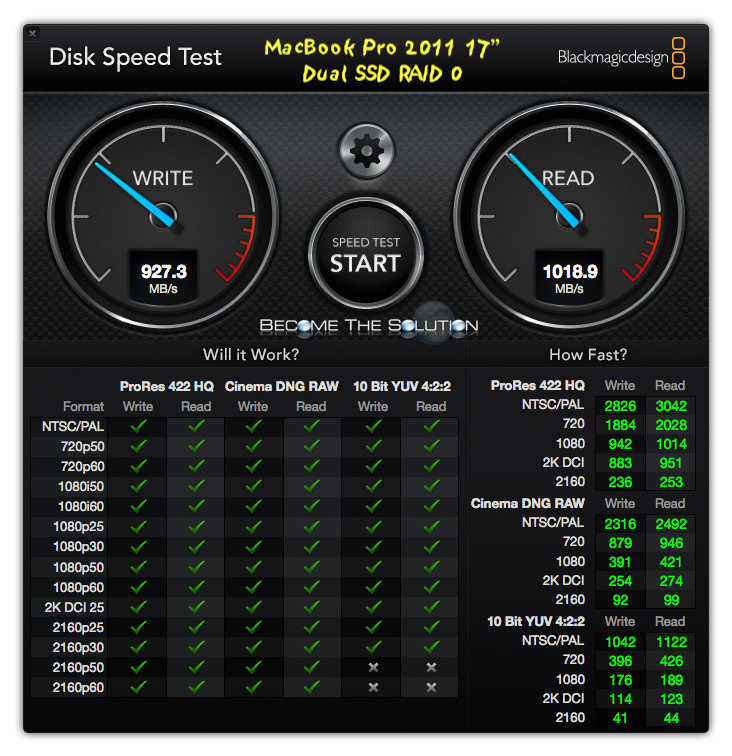 However, as long as you are running the latest version of Mac OS High Sierra 10.13, you can reliably run a 2nd SSD drive in the MacBook Pro optical drive bay at 6GB/s without issues. 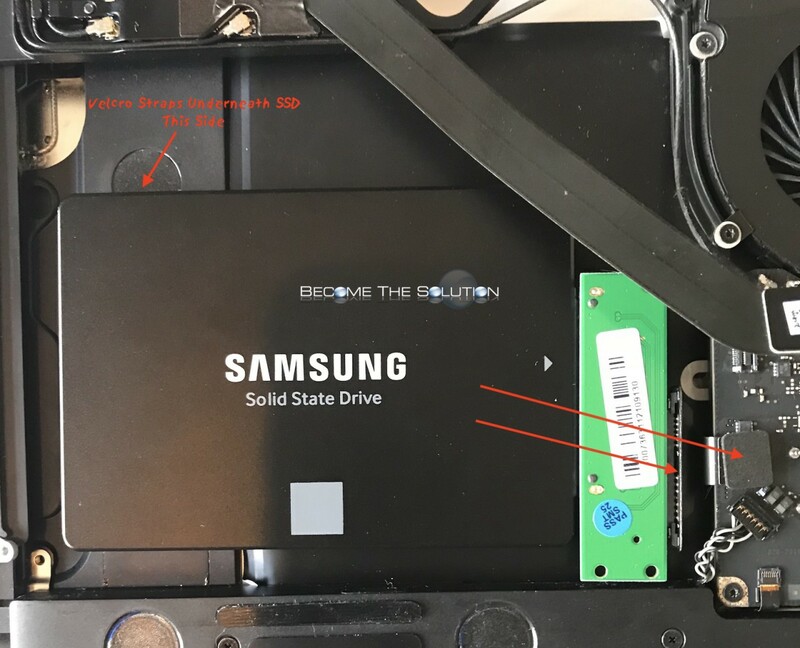 After removing the optical drive from our MacBook, we unscrewed the OWC Data Doubler chip from the steel harness (because we want the least amount of weight inside our MacBook Pro) and connected it to our Samsung solid state drive. We used sticky Velcro strips underneath the SSD drive to hold it in place. We did not shield our drive since the Velcro strips lift the drive a bit from the chassis of the MacBook Pro. After connecting everything, it was time to configure RAID 0. This is not easily accomplished in the latest version of Mac OS High Sierra 10.13 due to Apple’s support of RAID. However, you can create a fully-functioning hardware RAID 0 following our guide here. Tests with disk speed magic show us achieving near 1000MB/s read and write speeds with our Samsung 860 EVO’s and RAID 0! The 2133MHz ram shows around a 14% increase in performance throughput versus 1600MHz ram according to our GeekBench 4 tests. The HyperX ram modules report correct speed 2133 MHz in Apple System Profiler. If anyone has successfully tested 32g of Ram (2x 16g) inside a MacBook Pro 17”, please let us know about the RAM type you purchased using the comment form below. It seems only 1600MHz ram for 2x 16g modules exist today, so while it may be possible to double the amount of RAM in the MacBook Pro, faster ram (2133MHz tested in our unit) is likely better in different situations. The MacBook Pro 17” Late 2011 model was the last Apple machine to carry an ExpressCard. ExpressCard has quietly dissolved over the years (originally owned by defunct Personal Computer Memory Card International Association PCMCIA and is now managed by USB Implementers forum.) and you won’t find any new laptops with a slot. Apple put its money on manufacturers developing unique and exciting products for the ExpressCard standard, but it never took off. In reality, the evolution of faster onboard USB and Thunderbolt ports on Apples laptops quickly made ExpressCard a thing of the past. 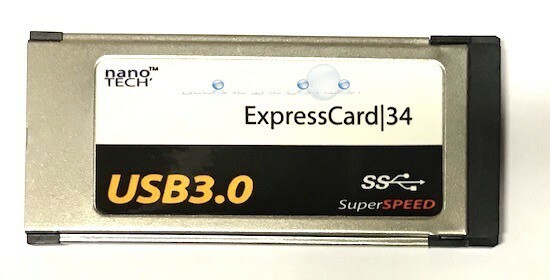 We found a low profile 2x USB 3.0 ExpressCard/34 adapter on eBay . It was compatible with Mac OS High Sierra, did not require a driver, and was reasonably priced at $34. 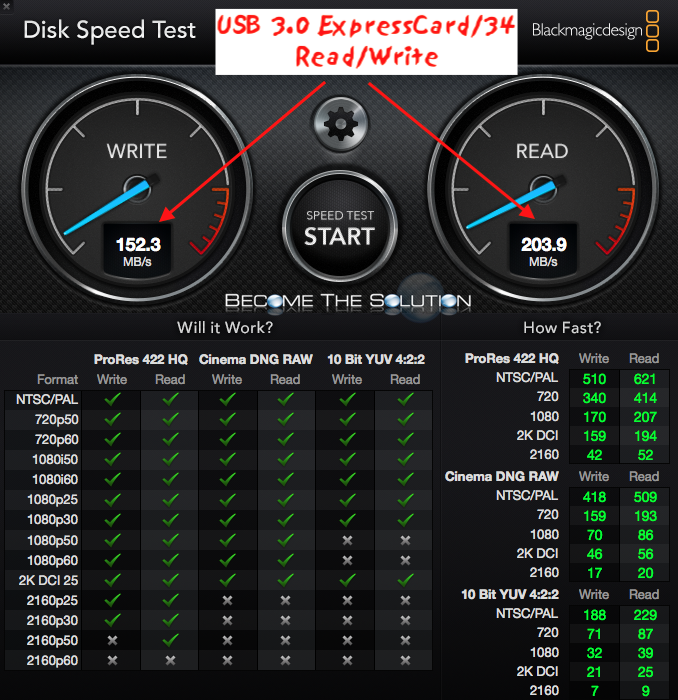 We tested MacBook Pro onboard USB 2.0 and USB 3.0 ExpressCard speeds using a USB 3.0 SSD (SSD has 500MB read/write speeds) external drive. ~150MB/s write and ~200MB/s read USB 3.0 speeds - awesome! There are many eSATA and multimedia ExpressCard 34 slot readers and some with USB/eSATA/FW 800 ports mixed. Search eBay and Amazon. More Upgrades Down the Road? What Other Upgrades? 32g ram modules may be a possibility, but would have to perform at a higher clock rate to really notice a speed performance. 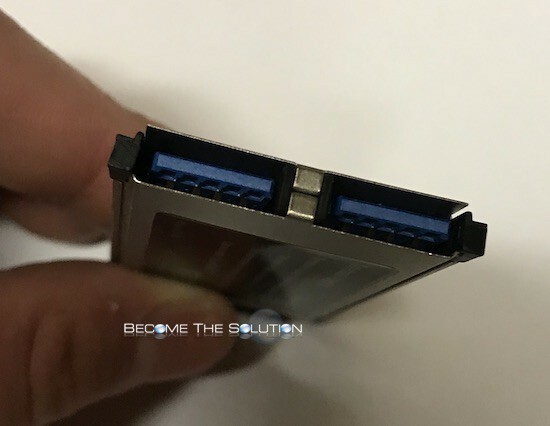 Faster SATA III SSD drives may come out, but will be limited to the SATA III bus of 6Gb/s or 600MB/s throughput of sending and receiving data. Do you own a faster MacBook Pro 17” 2011 model with better upgrades? Let us know!